The historic streets of Chinatown on Grant Avenue was transformed into a lively, colorful pedestrian bazaar for the 24th Annual AT&T Autumn Moon Festival (September 6-7, 2014). Hosted by the Chinatown Merchants Association, this event will be filled with fun arts and crafts booths, cultural exhibits, children’s activities, authentic food, corporate sponsors and non-stop entertainment. The festivities opened with a grand parade led by Mayor Ed Lee, civic officials, beauty queens, cultural performers and lion dancers. 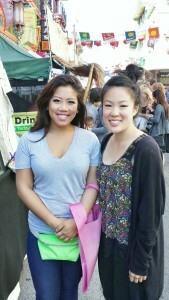 The Moon Festival attracted throngs of local residents and tourists from all over the San Francisco Bay Area. This Chinatown festival was a shopper’s bargain paradise. Thousands of Asian arts and crafts, housewares, plants, jewelry, and beauty products at special prices in well-stocked booths covering several city blocks. Several vendors was selling a large assortment of the traditional mooncakes. Several vendors offered unique ethnic foods. In addition, sponsors provided free gifts, games, and raffles. 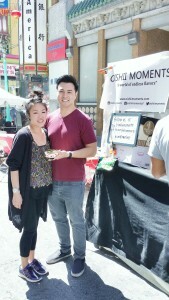 Oishii Moments had a booth in Chinatown where we served speciality chili frito pies. Thanks for everyone who stopped by! Oct 10 My First YouTube Video: Hello World!